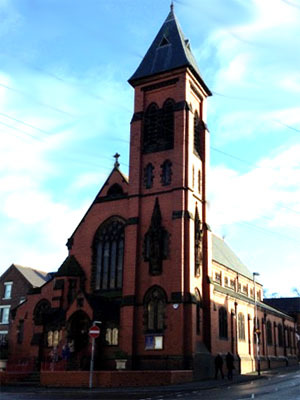 A neo-Gothic red brick church with a spire. It looks quite dark and forbidding from outside but is bright and fresh inside. Nicely decorated with stone and gilt details behind the tabernacle. There is a very nice hanging rood cross above the sanctuary. The newsletter is bursting with parish events and news and opportunities to help others and to share your faith. There are lots of groups and programmes for all ages. This is a parish that studies together, prays together and celebrates together. Crewe was a tiny village with a population of about 70 until the Grand Junction Railway opened its locomotive works there in the late 1830s. A new town quickly grew up around the railway station, and the town was also named Crewe even though it was independent of the village. The railways still figure prominently in the local economy. Rolls-Royce motorcars were manufactured in Crewe until 2003; Bentley Motors Ltd now occupies the Rolls factory. Crewe Crater, on the planet Mars, was named after the town. The streets around the church are laid out as rows of terraced houses. The church sits on a corner of one of these rows. A great amenity for the church is a very large car park, which is free on Sundays, nearly adjacent to the church in the next street. The Revd Jerome Fagan, parish priest, celebrated mass and preached. I was greeted with a friendly hello by people walking from the car park. There were three official welcomers in the porch who gave me a hymn book. They had name badges on and one of them opened the inner door for me. It was a standard bench pew with a decent place to kneel in front. A general calm friendliness filled the church. People were busy setting up for mass or exchanging news with friends. "Good morning. Father Jerome will be our celebrant today." This was followed by several announcements, and then: "We are all one in the Spirit. Please shake hands with those around you." This sounded a bit cringeworthy but is obviously something the congregation are used to, as they shook hands and greeted each other generously. I was a bit horrified but it did seem to energise the crowd and prepare them for mass. The processional hymn followed. The hymn book was Liturgical Hymns Old and New. A handy sheet of the parts of the mass had been glued inside the front cover. Useful for visitors and those who don't know the words of the new translation yet. In the back was the parish mission prayer, which was read aloud by everyone as a final prayer after holy communion. An organ, which accompanied a small but efficient choir who sang well. The whole congregation sang with enthusiasm. Wondering how to make my parish community a little bit more like St Mary's. People joined in, sang, and said the responses and prayers as if they really believed them. The mass was a straightforward English Sunday mass. I have probably made the congregation sound very happy clappy. They weren't  but they were focussed on the mass and pleased to be there. Father Jerome led us smoothly and prayerfully. 10 – In three minutes Father Jerome put his argument across, covered all three readings, and gave us something to think about. Impressive. He spoke about our personal preparation for Ash Wednesday and Lent. The readings had shown us people who did not believe themselves worthy to serve the Lord. He suggested we use their example and have the courage to pray for a pure voice as Isaiah had experienced; the courage of St Paul to preach; and the belief of Simon and his companions who threw out their net when Jesus asked them despite the unlikelihood of any fish. The congregation prayed the parish mission prayer at the end of a period of silence following holy communion. Praying it with them was quite moving, as they are clearly a community who try to care for each other. The extended introduction at the beginning of mass. I'm sure it was done in a spirit of friendliness and welcoming, but it gave the idea that we were preparing to watch a show rather than participate in worship. I was half expecting to hear a list of topping choices for our pizza! But being asked to greet each other was a friendly touch, so I'm not really faulting it as being totally hellish. I went to light a candle and pray. A man and his granddaughters were lighting candles and discussing prayers. This was a lovely moment as I prayed myself. I must have looked a bit forlorn as I came down the nave, as a lady suddenly approached me and hugged me. I have never been hugged by a stranger in a Catholic church. I was a bit surprised, but I left feeling comforted by the gesture. Father Jerome said there was coffee in the hall, but I couldn't find the hall. So after the hug I went home. 9 – If I lived nearer Crewe this would become my regular church. The friendliness and participation of everyone in church.